Today I'm playing along with the CAS(E) this sketch challenge. 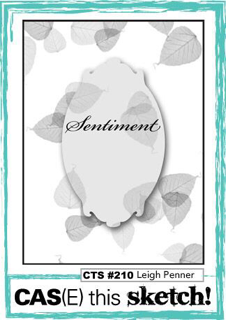 I was thrilled to put my newest stamps from So Suzy Stamps to use for this design - The Ranunculus outline and Beech line leaf. The inspiration sketch for this challenge is shown a little further down in this post. Using the MISTI tool, I lined up the flower stamp on the edge of the cut out square (using My Favorite Things Die-namics stitched squares) so that it stamped partly on the edge as well as onto the card base underneath. I used Color Box pigment ink in pink and heat embossed with clear embossing powder. I then masked the flowers with post it tape on the edge, before stamping the leaves in ColorBox dye ink in Celery. Since the leaf has such an intricate design, I learned a light touch was best to get more of the lovely details. I varied the pressure a bit with each one to make them look a little more unique. 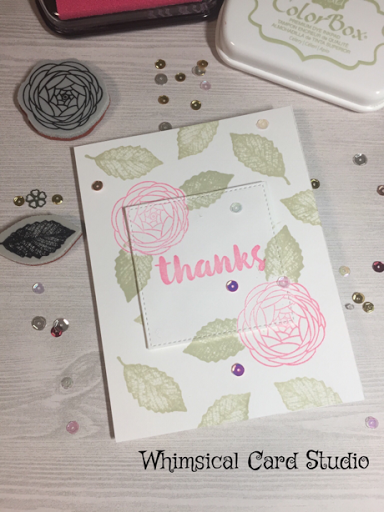 I used a simple "thanks" sentiment stamp embossed in the same pink pigment ink and heat embossed with clear embossing powder. After the stamping was done, I popped up the square in the center, making sure it lined up with the stamping underneath, then added a few sequins to complete. I hope you enjoyed learning about how I put this card together. If you'd like to keep up with my weekly posts (twice a week) please take a moment to subscribe to my blog by email or the Bloglovin' link on the right hand sidebar. I love to get feedback so if you were inspired by this post, please consider leaving me a comment. So glad you stopped by Suzy - looking forward to making several more with these!! This is so pretty!! Love the flowers you used on this!! thank you so much Nora! Glad you popped in to take a look.